The thing is, M has recently replaced yogurt with cheese. Lots and lots of cheese. Say “cheese” about 130 times and that’s about the number of times the word comes out of his mouth on a daily basis. I am not exaggerating. While I’m happy that he’s now found another source of calcium protein to add to his daily diet, this new obsession with cheese means that we had a huge tub of yogurt soon to expire in the refrigerator. So what’s a momma to do? Whip out the food coloring, of course! 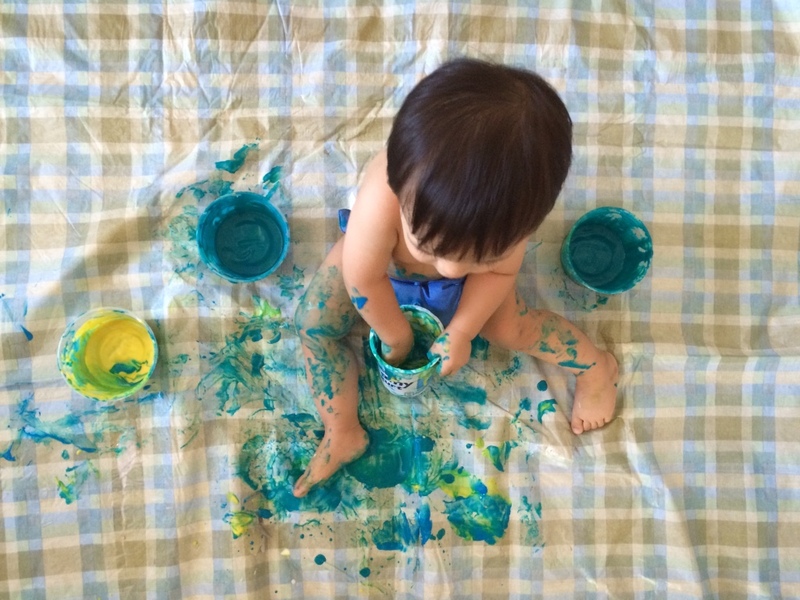 This is an activity I’ve done with M once before–back when I put waaaay too much food coloring and he made an incredible (but adorable) mess of himself. I’ve since then learned to take it easy on the food coloring though, because it makes cleaning him up a lot easier! 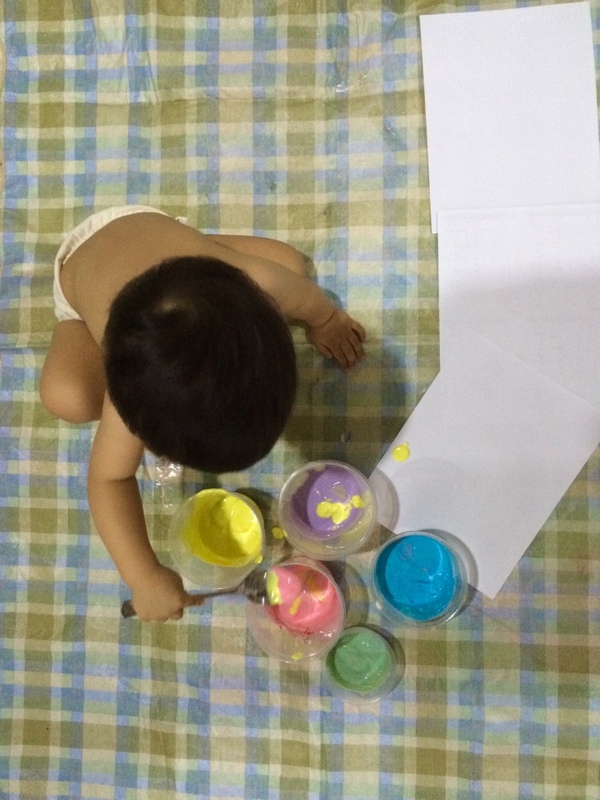 Silly me brought out some paper today, thinking that he would want to paint with his hands like last time. But no, mommy forgot that he is now going through a “pouring” phase. He sat patiently as I put the colorful tubs of yogurt in front of him. Then he looked at me and said, “spoon?” And so I gave him a spoon and he proceeded to transfer globs of yogurt from one container to another. Sometimes with the spoon, sometimes without. 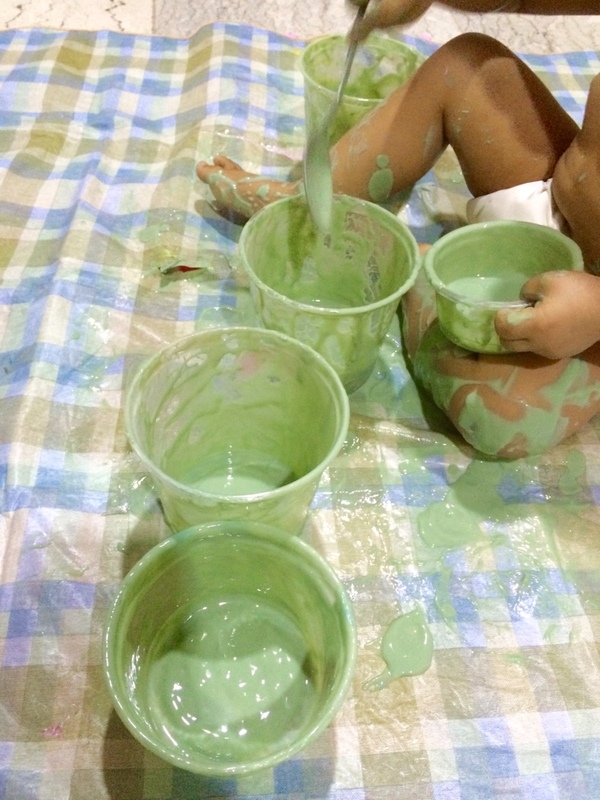 While I do aim to search for a less wasteful recipe for edible paint to use in the future, I’m happy to report that this makeshift experiment was a huge hit. Not only did it expose the little boy to something different, but it kept him occupied for ONE ENTIRE HOUR!!! If that isn’t a true measure of success, I don’t know what is. What comes next? A bath, of course! So cute that he loves yogurt! My littlest one can’t have yogurt, so I’m jealous that yours get to eat and play with it too!